A child is killed every other day in a non-traffic car accident. In many cases, it's a young child whose been backed over by a parent or caregiver who didn't see the child behind the car. The price to help avoid such tragic accidents? About $200. 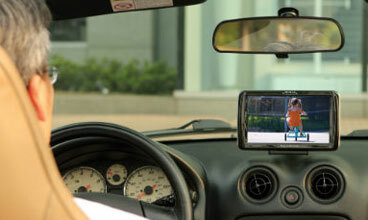 Portable navigation device maker Magellan has introduced a new back-up camera accessory for its RoadMate Safety Series portable navigation devices (PNDs) that shows a 120-degree view around the rear of the vehicle––automatically displayed on the PND screen after the driver shifts into reverse. 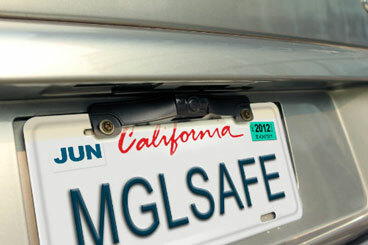 The Magellan Wireless Back Up Camera includes a small camera that attaches to the top or bottom of the vehicle's rear license plate and a transmitter that sits in the trunk, connected to the vehicle's backup lights wiring. On the other end of the wireless transmission is a receiver for the PND. It connects with the PND's audio/video-in port and is powered by an included vehicle power adapter––a "Y-adapter" that powers both the receiver and the PND from one 12-volt outlet in the vehicle. The camera, which is both waterproof and dust-proof, can be adjusted up or down by 45 degrees to get the best view whether it's installed on a Smart car or on an SUV. Built to Magellan's specifications by a third-party company, it has been optimized to work in bright-light and low-light conditions in which other back-up cameras may yield washed-out or too-dark video. The transmitter has a range of 45 feet, is water resistant and triggers the PND screen to switch from navigation to rear-view mode as soon as the vehicle's backup lights come on. Without installation, the Magellan Back-Up Camera kit is priced at $149.99 . Professional installation costs about $80 at Best Buy. Compatible Magellan Safety Series PNDs include the RoadMate 1700, 1700-MU, 9055 and 9055-LM, which range in price from $199 to $399 and are not included. We think the Techlicious blog is great - these products are for EVERYONE, and any family should have a backup camera in their vehicle. One thing we think is important to emphasize with first time buyers is that a wireless backup camera system does require some wiring - to the transmitter - and may or may not be a comfortable DIY installation for the buyer. We put together this brief video on exactly what that installation involves so that a buyer can decide if they feel comfortable taking on the task: http://youtu.be/wJextwChL60 Highly encourage anyone who has not done any type of simple wiring before to watch before attempting to install. Wireless back up systems are still not reliable enough for most consumers and certainly not for commercial or industrial uses. A wired back up camera system should always be considered first and as a last resort your should consider a wireless system. Analog wireless systems operate on the same bands and Bluetooth, baby monitors and other wireless devices and are subject to enormous amounts of interference. The difference in installation costs between a wireless system and a wired system can be double but the overall satisfaction between the two systems is even greater. Always consider the installation prior to purchasing any system, there are trade offs to every design.